A lot people love to wear braid, especially the young ladies! And the summer is coming, the braided hairstyles become popular. Today I’d like to show you how to do a cool and stylish 5 strand braid. 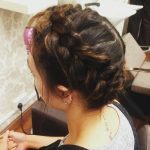 The five strand braid is easy to create and is a perfect hairstyle for school, college, university and even work ( if you work in a creative place. Hi my beautiful friends, how are you all doing? It’s Mimi here today, and today’s tutorial is going to be a five-strand braid. I know, I’m so excited to show it to you guys, so recently I did a four-strand braid and when I did it, I thought it was so hard at first and I thought I could never learn it or teach you guys, and I did, yay! And after I did the four-strand braid I thought, okay, I need to challenge myself a little more – what’s the next thing? And of course I found out there is another braid which is more complicated and it’s a five-strand braid and you know, I watched a few tutorials and at first I couldn’t get it and I just kept trying and trying and I finally got it and it looks even more awesome than the four-strand braid. I actually do like it more than the regular braid or a fishtail braid – this is my favorite right now. I’ve been wearing my hair like this quite a lot. It’s really easy to recreate and I think it’s a perfect look that you can wear you know, back to school, back to college university – wherever you’re going or just you know, work. So, let’s get into the tutorial. For this tutorial pretty much, we’re not going to need a lot of things. You will need a hairbrush to brush your hair. I am wearing my Luxy hair extensions in chocolate brown, 160 gram set. I just clipped them in – I haven’t bothered blending in or anything. You might also need some – not you might – you will need some hair elastics. So I’m using just the really tiny ones that are like, kind of see-through so they really blend with the hair and you can’t really see the elastic. You will or might need some hair spray – this is my favorite all natural hair spray by Intelligent Nutrients. And again, depending on what kind of look you’re going to go for I’ll explain at the end of the video, you might or might not need your curler. This is my Cortex Curler – yeah it is a Cortex – this is my Cortex Curler 1 and this barrel is a 1 inch barrel. The first thing you want to do is just brush the hair like always. So, just – here’s a regular paddle brush. Start with the bottom and just brush it all the way up. Once you brush the hair, you want to split it into five equal sections. So you want to just grab the hair and start splitting it into five equal sections. Some people say it is easier for them to break it into two sections and then four, and five, but what I do is just grab one hand with one hand I try to you know, make kind of equal sections and then if I need to add more, add more. The key is just you know, to try and make it as equal as you can possibly can. As you can possibly can? Alright, so I’m just going to add more here. So this is what you’re going to have once you’ve split all the hair – you’re going to have five different sections. And the key to braiding this look is kind of understanding where all the sections go. So in your left hand you will have section one and two, and in your right hand you will have section four and five or the other way around – it doesn’t really matter. And then the third section we’ll have kind of just linger in there – It’ll just be like hanging in the middle. And all you’re going to be doing is, bring section one over two and under third, and then the same thing you’re going to do on the left hand – so you’re copying the exact same steps. So, first goes over second and under the third and I will show you now how you actually do that in practice. So, bring it over and then under, and then kind of just push it up. And then bring the first from the left over, and then under and push everything up. Over, under, and then over, under. It does really help saying over and under just so you kind of keep track of what step you’re at – over, under, over, under – and keep pushing it up for a more neat look. Over, under, over, under, over, under, over, under, over, under, over, and under. This is where I’m going to stop. All you want to do is just grab one of those elastic bands and secure it at the end. So just secure it neatly at the end and it will look something like this, and then what you want to do is just kind of pull on the strands of the hair to make this beautiful braid even thicker. Oh, my God it looks amazing – that’s why I love this braid. There’s just nothing like it. It’s just beautiful. You can either stop here or you can go ahead with me and do a little more romantic waves around the hair that’s sort of falling out. If you do enough layers, you’ll have a lot of hair falling out. And to make it a little prettier or romantic looking, what you can do is just grab certain sections on this side or on this side that are kind of falling out, and start curling them away. And you just want to hold them for a few seconds – not longer – and release. It’s a like, really pretty kind of wave, but I will break down with my fingers after. So just curl it, and let go. And then maybe I’ll do a little bit on the bangs as well. And then just right away you just kind of break it with your fingers so all you have is sort of like – you don’t have any defined waves just like kind of a mess here. Like a pretty kind of mess. And then I’m going to go ahead and take a section from here and just curl it away as well. So if you do have layers, you’ll have a lot of this. If you don’t, you can just pull the strand and just kind of curl it away. This will only take a minute or two, but I think it makes the whole look a little more romantic – a little more girly. So once you’ve curled it, you can like, break it with your fingers. And the last step is just to spray the hair with the hair spray. Once you spray the hair you’re pretty much done. This is what it should look like and you know, it’s perfect. It looks so awesome. If you wear it to school, I’m sure all the girls will be asking you how you braided your hair – or work – anywhere you’re going to go, you’re going to get peoples’ attention because you don’t get to see this kind of funky braid you know, quite often on the streets or at school – or anywhere really. I hope enjoyed this tutorial. Thank you so much for tuning in. Definitely give it a try and let me know if it worked. If it didn’t work, try the four-strand braid. Practice it, practice it, and then once you understand how the four-strand braid works, this one will be you know, honestly super easy. Thank you so much again, and I love you guys. I’ll see you in the next tutorial. Bye. If your hair is long enough, also you can try the five strand braid headband! Here are more hair tutorials for you, enjoy.